Basically Android and iPhone use Phone Name as identity, but iPhone phone name by default will change automatically when the first time we register and sign-in our account at our iPhone, therefore without any additional rename, our phone will automatically change with specific user-iPhone such as smith-iPhone or lucy-iPhone or users-iPhone. 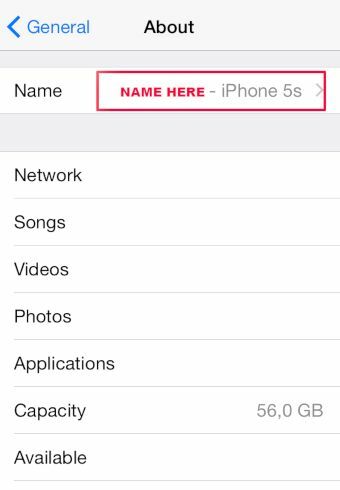 How To Change or Rename iPhone / iPad Name Identity ? What is Pros and Cons Rename Our IPHONE PHONE NAME ? Do not worry, because rename our PHONE NAME / DEVICE NAME is safe, it will not effect anything to our smartphone or table performance or connection or anything. Just change the identity. By rename our device name, then the connections result will be easy to know which our iPhone / iPad when we want to find or select at Wifi Router. At Wifi Router, our iPhone / iPad name will shown as Hostname. We can our iPhone / iPad anytime as we want, and it will not effect to device connection or nothing change with connection speed. How to Easily Master Format ZTE BLADE V7 PLUS with Safety Hard Reset? How to Easily Master Format SONY XPERIA Z5 COMPACT (E5803 / E5823) with Safety Hard Reset? How to Easily Hard Reset LENOVO VIBE SHOT (z90-7 / VIBE MAX) with Safety Master Format?